As the capital of Spain since 1606, Madrid has grown into a huge, bustling, vibrant city. Spanish royalty gathered here for centuries, and you’ll see evidence of the city’s leading role in history with its lavish palaces, grand plazas, elegant boulevards, and sweeping gardens. Madrid’s well-preserved historic treasures share the streets with modern development, including soaring skyrises, lively nightlife, and the busy Gran Vía, a street that’s hard to tell apart from Broadway in NYC. When I walked the streets of Madrid, I was fascinated by the scale of its beautiful buildings, old and new. Read on to learn about the 20 best things to do in Madrid, the romantic, historical, multicultural home to over 3.2 million people. To get you situated in the big city, check out the map below with the most popular places to visit in Madrid. This map features major things to see in Madrid, like the Royal Palace, Plaza Mayor, and Museo del Prado. Now that you have a sense of the city’s layout, read on to learn about what to do in Madrid and its many museums, palaces, parks, and tapas restaurants. First stop, the famous Palacio Real, or Royal Palace. The city of Madrid truly began to emerge as Spain’s royal capital in the 1560s when King Philip II moved his court here from Toledo. Madrid has officially been the capital of Spain since 1606. Towering above its other palaces is the stunning Palacio Real, an impressive achievement of baroque and classical architecture. The Royal Palace, constructed by Philip V in 1739, is still the official residence of Spain’s royal family today, though it’s now only used for state ceremonies. Most of the year, the palace is open to the public. With over 3,418 rooms, the Palacio Real is one of the largest in Europe. You can explore the lavishly decorated rooms and banquet halls and admire paintings by Spanish and Italian masters, like Goya, Velázquez, and Caravaggio. Beyond viewing the chandelier-filled rooms of the rich and royal, you’ll see collections of porcelain, watches, silverware, and the world’s only preserved Stradivarius string quartet. The Royal Armoury is also worth a stop for anyone interested in medieval armor and weaponry. Tickets: Entry €10; Guided tour €11; Students and children €5. You can buy tickets in advance on the official website. Wednesdays have free entry! As a major global city, Madrid is home to some major art museums. Three of its best are clustered together along Paseo de Prado east of the old city in a neighborhood called the Golden Triangle of Art, one of the most popular places to visit in Madrid. Set aside a day or two to visit one or more of the three museums that make the triangle – the Prado, the Reina Sofia, and the Thyssen-Bornemisza. Museo del Prado – The Prado houses one of the world’s finest collections of 12th to 19th century European art, as well as a great collection of Spanish art. Among its spacious halls you’ll see master works by Goya, Velázquez, El Greco, Titian, Rubens, Caravaggio, Botticelli, and the exceptional Hieronymus Bosch. Adult tickets cost €14. Students are free. You can also get free entry from 6 to 8 PM Monday to Saturday and 5 to 7 PM on Sundays. Just be aware that the museums can get crowded during free entry times. Reina Sofia – This museum, named for Spain’s Queen Sofia, picks up where the Prado leaves off – in the 20th century. You’ll see masterpieces by mainly Spanish artists, like Picasso, Dali, Gris, Miro, and Serrano. The most famous work is probably Guernica, Picasso’s striking anti-war response to the bombing of Guernica in the Spanish Civil War. The Reina Sofia is open from 10 AM to 9 PM everyday but Tuesday. Admission is 8 euros. Entry is free for students under 25 and children. Thyssen-Bornemisza – This once private collection has turned into a huge museum of European art. The collection largely fills in the gaps of the Prado and Reina Sofia with its 20th century works from all over Europe and America. You’ll see many works of impressionism, expressionism, and cubism by renowned artists like Monet, Renoir, Degas, Pissarro, Toulouse-Lautrec, Gauguin, Cezanne, van Gogh, Picasso, Munch, Magritte, Hopper, de Kooning, Kandinsky, and Pollock. Entry is 12 euros for adults and 8 for students. Children under 12 are free. The Thyssen-Bornemisza is open from 10 AM to 7 PM everyday but Monday, when it opens at noon and closes at 4 PM. Step away from 18th century palaces and artwork and into modern-day Madrid by heading to Gran Vía, the wide avenue that stretches across the city center. Because of its large cluster of theaters that put on shows and musicals, Gran Vía has been likened to Broadway in New York City. It’s one of the biggest and busiest avenues in the city, with billboards, lights, shops, bars, cinemas, and a casino. While it’s more modern than other areas of Madrid, Gran Vía also has its share of historic architecture. One famous building is the Metropolis Building, a French, Beaux-Arts style building constructed at the turn of the 20th century. The opposite end of Gran Vía ends in the Plaza de Espana. This large square is lined by high-rises, notably the Torre de Madrid and the Edificio Espana, and is home to a statue of Miguel de Cervantes. About halfway down Gran Vía you’ll also see Europe’s first skyscraper, the 290-foot Telefónica Building. Besides sightseeing, you can also go shopping for high-end jewelry or clothing at popular stores like H&M, Primark, Zara, and Stradivarius. The Palacio de la Prensa, Capitol Cinema, and Callao Cinema all show films. Just make sure they’re in English if you’re not a Spanish speaker, as Spanish people tend to dub films with voice-over actors. You can also catch a play or musical at the Lopa de Vega Theater or Compac Theater. Of all the things to do in Madrid, visiting Mercado de San Miguel is one of the most delicious. Mercado de San Miguel is an indoor gourmet tapas market in the center of Madrid. Over 30 vendors sell tapas, paella, pinchos (little open-faced sandwiches), jamon (ham), olives, sushi, and baked goods in this beautiful wrought iron and glass building. You can snack and sample around the market with a glass of beer, wine, or champagne in hand or choose a counter or central table to enjoy your meal. As a beloved center of Spanish gastronomy, the Mercado de San Miguel can get pretty crowded. The Mercado de San Miguel is open everyday from 10 AM until late. On Monday, Tuesday, Wednesday, and Sunday, the market closes at midnight. On Thursday, Friday, and Saturday, it stays open until 2 AM. Every Sunday, Madrid’s Barrio de Embajadores (Ambassador’s neighborhood) hosts an enormous open-air flea market. The countless vendors spread down Calle de la Ribera de Curtidores and the surrounding narrow streets. You could spend hours rifling through clothes, antiques, household goods, electronics, records, and luggage. There’s a lot of junk, but you can discover some treasures, as well, especially at stalls where artisans sell their own crafts and creations. Make sure to keep one eye on your purse and pockets as you inch along the crowded streets. Pickpockets may lurk among the crowds of shoppers. El Rastro is open every Sunday from 9 AM to 3 PM. The fact that the Spanish language has a verb for eating tapas, tapear, shows how integral this tradition of small plates is to Spanish culture. Tapas often come for free when you order a drink (like wine or beer, not coffee). Some typical tapas include a pincho (small open-faced sandwich, perhaps with a strip of jamón serrano, jamón ibérico (both cured hams), or manchego cheese and olive oil), tortilla española (a slice of potato omelette), revuelto (a mix of fried eggs, bacon, and potatoes), or simply strips of dry cured ham. You can also order a variety of tapas beyond the free one that accompanies your drink. Usually about two to three tapas per person is a good amount, depending on how hungry you are. You can order a bunch for the table and share. Two of Madrid’s most famous tapas bars are Casa Lucio and Taberna Tempranillo. Both serve up excellent tapas and a wide variety of Spanish wines. Some other great spots are the trendy Cachivache, the modern Gabinoteca, the traditional Bodega Ricla, the inventive Vi Cool, the always crowded El Tigre, the local favorite La Esquina del Eusebio, and the century-old La Casa del Abuelo. As a huge city, Madrid has tons of tapas bars. You might find your favorite just around the corner from your hotel. In addition to its fancy palaces and wide boulevards, Madrid reveals its royal history in its beautiful historic plazas. These huge squares served as the sites of markets, bullfights, soccer games, and even public executions during the Spanish Inquisition. Today, most of the plazas feature shooting fountains, historic statues, colorful buildings, and numerous cafes where you can sit and watch the city pass by with a café con leche (espresso with milk). Puerta del Sol – This plaza, which translates to Gate of the Sun, is a busy square and popular meeting point in the city center. Notable landmarks are the big Tio Pepe (a brand of Sherry) neon sign above the square and the famous statue of a bear eating from a strawberry tree. 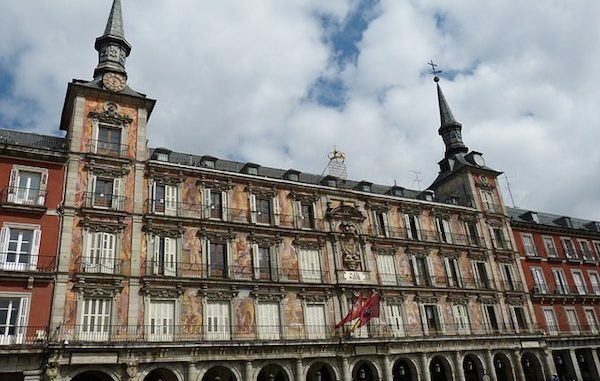 Plaza Mayor – This large square is one of the most heavily visited by tourists. While most of the restaurants aren’t worth the high prices, the plaza is worth visiting for its colorful architecture, wrought iron balconies, nine entrance archways, and bronze statue of King Philip III. Plaza de la Villa – For a quieter square, head to the pretty Plaza de la Villa. Across the cobblestones you’ll see the picturesque Casa de la Villa, Madrid’s former town hall. Plaza de Santa Ana – This popular square is a great spot to sit outside with drinks and tapas. At night, the various bars and restaurants seem to merge into one big crowd with food and drinks. If the weather is nice, head to Plaza de Santa Ana for dinner, drinks, and atmosphere. For a city of over 3.2 million people, Madrid is incredibly green. It has over 33 million square meters of park land and more than 40 parks within the city limits. Its biggest park, Casa de Campo, is over five times the size of Central Park in NYC. This huge park has sweeping lawns, a large lake, the Madrid zoo, and spaces for sports games, concerts, and other events. One of Madrid’s most beautiful parks is the Parque del Buen Retiro, known as El Retiro. Walk along the tree-shaded paths, take out a rowboat on the lake, check out the Alfonso XII and Fallen Angel statues, and admire the delicate Crystal Palace, a structure made entirely of glass. For three euros, you can also stroll through the nearby Royal Botanical Garden. You can also enjoy great views from Parque del Oeste, located closed to the Royal Palace. The park has a lovely rose garden, as well as the Templo de Debod, a reconstructed Egyptian temple that Egypt gave to Spain in 1968. Finally, the romantic Parque del Capricho is worth a visit. This historic park, designed in the mid-18th century, has stone fountains, manicured gardens, and lakes full of swans. No trip to Spain would be complete without tasting some of its world-renowned wines. Many of the top Spanish wines are produced in the regions of La Rioja and Ribera del Duero, popularly from the full-bodied tempranillo grape. There are traditional wine bars throughout Madrid with intimate, dark wood settings harkening back to the 1920s and a great selection of fine wines, cheeses, and cured meats. Two great wine bars are Casa Gonzalez and Stop Madrid Taberna 1929, both about a century old. Casa Gonzalez has over 35 wines from across Spain available by the glass, along with an excellent selection of cured meats and cheeses. Stop Madrid is an atmospheric bar with a great variety of wines and tapas. Many of the tables at Stop Madrid are repurposed wine barrels. When I travel to a new city, one of my first questions is, where should I eat? Madrid is a huge city with an endless numbers of restaurants and all manner of food, ranging from traditional Spanish to modern fusion to cuisine from all over the world. Spanish people tend to eat on the late side. Lunch is usually served between 1:30 and 3:30, and dinner begins after 8, though eating dinner at 10 PM isn’t uncommon. Many bars and restaurants allow you to order a full size, or ración, a half size, or media ración, or a small plate, like a tapa or pincho (small sandwich). There are a huge number of touristy spots around the big plazas, like Plaza Mayor and Puerta del Sol. Most have outdoor signs with pictures of paella. These restaurants tend to be overpriced and not very good. Steer clear of these tourist traps if you want a more authentic experience. Walk a street or two away from the big plazas, and you’ll find excellent restaurants across price ranges. If you’re looking for tastes from countries outside Europe, you may want to head to Lavapies, a multicultural neighborhood with a variety of Latin American, Asian, and African restaurants. So what are some excellent restaurants in Madrid? If you’re looking to splurge, then you should check out the gourmet Spanish restaurants Viridiana, Sergiarola Gastro, La Terraza, Zalacain, Ramon Freixa, Indice Restaurant, or Diver XO. Most of these places call for dressing up and making reservations well in advance. Some mid-range choices for Spanish food are Arzabal, Lakasa, Las Tortillas de Gabano, Mercado de la Reina, and Alhambra. Al-Jaima is an excellent Moroccan restaurant. You might also be interested in checking out Restaurante Botín, a restaurant said to be the oldest continuously operating restaurant in the world and former stomping ground of Ernest Hemingway. For brunch, consider Perrachica, a modern place with a funky decor. For a cheap snack, you might check out one of Spain’s chain restaurants, the Museo del Jamon or Cerveceria 100 Montaditos. Museo de Jamon has €1 jamon sandwiches. 100 Montaditos has, as the name implies, 100 choices of montaditos, or small sandwiches, all of which cost between 1 and 2 euros (just like the pints of beer). Like its northern neighbor Paris, Madrid has a big cafe culture. If the weather is warm (or the place has heat lamps), then you can sit outside with a cafe con leche (espresso with milk) and watch the passersby. If it’s cold out, then you’ll find plenty of cafes with unique interiors, from cozy to bohemian to elegant. Some cafes with great coffee, pastries, and atmosphere are La Bicicleta, Cafe Delic, Cafe de Ruiz, and Cafe Gijon. You might also check out the famous Chocolateria San Gines for churros con chocolate, sticks of fried dough that you can dip in thick hot chocolate. As a favorite tourist spot, it can get crowded. However, it deserves its great reputation – the churros con chocolate are delicious and the interior is pretty and atmospheric. If you’ve never seen a flamenco show, you should definitely make time for one on your trip to Madrid. This Spanish folk music and dance originated in Andalucia, but it’s popular throughout Spain. You can buy tickets online, and prices range between 12 euros and 50 euros. Some of the top venues for flamenco are Cardomomo, Corral de la Morería, and Cafe de Chinitas. A flamenco show isn’t the only place you’ll be tempted to shout out, “Olé!” Join the spirited crowd at a soccer game, perhaps splurging to see Real Madrid at Santiago Bernabéu stadium. You can buy tickets for a game online starting from 40 euros. You might also check out the Vicente Calderón stadium on the river southwest of the city center. Vicente Calderon is home to the Atletico Madrid team. If you’re looking to get out into nature, you’ll be happy to hear that hiking trails and rock walls aren’t far away. The Sierra de Guadarrama mountains are just an hour away on the train (from Atocha station) or bus (from Moncloa station). The Gaudarrama mountains, by the way, are where much of the action in Ernest Hemingway’s For Whom the Bell Tolls took place. There are a bunch of hiking trails that start in the little town of Cercedilla. The trails are well-marked and lead to excellent viewpoints and peaks. A relatively easy trail is the 5-kilometer Camino de Agua. For a longer trail, you might try the Los Miradores path, which is about 9 kilometers long. It also crosses with other, more challenging paths, so you can veer off if you want more intensity. La Pedriza on the south side of the Guadarramas is another great area for hiking and bouldering. Climbers will find fields of rocks to play on, and hikers can walk trails that look over lakes and a castle. One popular path is the 8.5-kilometer La Gran Cañada. You can also climb El Yelmo, one of the highest peaks in the Guadarramas. Finally, climbers love to head out to Patones, an area of limestone rock with over 800 routes. You’ll find vertical walls and challenging over-hangs. Like the town of Cercedilla, Patones is also about an hour from Madrid. Check out the view from the top at one of Madrid’s many rooftop restaurants or bars. You can take in all the palaces and skyscrapers at once while enjoying tapas and watching the sunset. Some bars and restaurants with the best views of Madrid are Circulo de Bellas Artes and the Gourmet Experience. You might also be interested in the Teleferico cable car that takes you from the Paseo del Pintor Rosales street, over the River Manzanares, and into Casa de Campo park. The ride is just ten minutes or so. Tickets are €4.20 one way and €5.90 round trip. Madrid is situated along the Manzanares River. The riverbanks were recently renovated to include landscaped parks, walking paths, playgrounds, and bridges. They’re a popular spot for joggers, skaters, and cyclists. If you want to fit a workout in on your trip or simply get a taste of real Madrid life, throw on your sneakers and head to the Manzanares río-banks. Tons of popular European and American bands come through Madrid and play sold-out shows. I saw the band !!! (Chk Chk Chk) at Teatro Joy Eslava, a venue in a 19th-century theater, last time I was in Madrid and danced with the mix of locals and visitors. Some other great venues for concerts beside Joy Eslava are Cafe la Palma, Sol y Sombra, Costello Club, and El Sol. Check out their Facebook pages to find upcoming concerts. For a more low-key night, head to one of Madrid’s jazz bars. Some top places are Cafe Central, Segundo Jazz, Clamores, Populart, El Junco, and Cafe Berlin. Just as Spanish people typically eat dinner on the late side, they also don’t go out on the town until midnight or later. Places tend to stay open all night, and it’s not uncommon for the party to continue until 5 or 6 AM. If you head out for an early breakfast, you might find that many of your fellow diners aren’t up for breakfast – they’re ending their night with a very late night snack. If you’re going to experience the Madrid nightlife, you shouldn’t show up before 1:30 AM. Many of the all-night clubs don’t really start heating up until 3 or 4 in the morning. If you show up at midnight, you’ll probably be the only there! As a big city in a land of late-night people, Madrid has an energetic nightlife scene. Some of the top clubs are Kapital, Ocho y Medio, Fabrik, Pacha, Moma 56, and Vanila. Dress up a bit and don’t wear sneakers, or you might not get past the bouncer. If you’re sick of the tourist crowds around popular Madrid attractions like Palacio Real and Plaza Mayor, you might be interested in exploring neighborhoods off the beaten track as you plan out what to do in Madrid. Two increasingly popular neighborhoods are La Latina and Lavapies. You’ll find lots of small bars, art galleries, alternative theaters, and multicultural restaurants and cafes. La Latina is especially known for its abundance of outdoor bars and restaurants where people meet to have a small beer, or caña, at all hours of the day. Lavapies has a more bohemian, artistic vibe. Neither neighborhood has a lot of monuments or historical sights, but they’re both worth exploring to experience the atmosphere and get a sense of how real Madrileños and expats live. If you’re worried about running out of things to do in Madrid proper or if you’re just interested in history, there are some gorgeous towns and UNESCO World Heritage sites outside Madrid that are easily accessible by the high speed AVE train from Madrid. You can play a day trip or overnight visit on your own or join a group tour. The top five towns you can visit outside Madrid are Avila, Cuenca, El Escorial, Segovia, and Toledo. Avila is a gorgeous city with sturdy 11th-century walls adorned by 88 towers. For a small town, it has a great number of churches and cathedrals. Admire the Gothic and Romanesque architecture, as well as the white storks that build their nests atop the towers. Cuenca is another well-preserved historic gem that’s famous for its hanging houses built right on the edge of a canyon. Walk the steep, cobblestoned streets, admire the colorful houses, check out the 12th century cathedral, and try not to get dizzy as you peer down into the canyon. The town of El Escorial is home to the El Escorial palace, which includes a church, monastery, college, and library on its vast grounds. You can tour the interior of the palace, relax in the town’s main square, or go hiking in the nearby mountains. You can also visit the nearby Valley of the Fallen, a monument commissioned by Franco to honor people who were killed in the Spanish Civil War. Over 40,000 casualties of the Spanish Civil War were buried in the Valley, and Franco was buried in the church nearby. Segovia is an ancient city with 1st or 2nd-century Roman aqueducts, a huge Gothic cathedral, and a beautiful castle. Finally, you can head south from Madrid to visit the fairytale town of Toledo. Everything is beautiful in this walled city atop a hill, and you could spend hours winding through its maze of ancient streets. If you’ve always wanted a sword, Toledo, a center of steel-working since 500 BC, is the place to get one. While you’ll take the AVE train to reach these towns, how will you get around the city of Madrid itself? Madrid is full of beautiful neighborhoods for walking, but you’ll need a form of transportation other than your legs to get from place to place. Read on for some tips on how to navigate Madrid. No matter what you want to see in Madrid, one of the best ways to get around is via the extensive metro system. Madrid’s metro is actually the second largest in Europe, second only to London. A single ticket costs between €1.50 and €2.00, while a ten-trip tickets costs between €12.20 and €18.30. You could also buy an unlimited travel pass for one day (€8), two days (€13.40), three days (€17.40), five days (€25.50), or seven days (€33.40). These passes also work for the buses, which go to the spots that the metro misses. Most announcements are made in both Spanish and English. Madrid also has lots of taxis and Ubers, along with a public rent-a-bike service called BiciMAD. Madrid isn’t the most bike-friendly city, but it’s building more and more bike paths. If you stick to certain areas, you might enjoy renting a bike to see the sights and get from place to place. In closing, consider these final tips as you plan what to do in Madrid, Spain. Madrid is a grand, exciting city with fun things to do at all hours of the day and night. Its prominent role in Spain’s history is clear in the opulent palaces and grand plazas dating back over four centuries. As a major global city, it’s also a modern, cutting edge place that’s home to people from all over the world. If you get tired of the bustle of the big city, you can relax in one of the city’s many beautiful parks, visit a medieval town, or go hiking in the Guadarrama mountains. When in doubt about what to see in Madrid, you can’t go wrong with a daytime caña and a tapa of manchego cheese, olives, or jamón ibérico. After living in Spain for a year, I have a special place in my heart for Spanish tapas, flamenco music, and a schedule that incorporates a mid-day siesta. After a few days enjoying all the memorable things to do in Madrid, you might start to adopt the pleasurable lifestyle of the Madrileños and find it stays with you long after your trip to the Spanish capital ends.